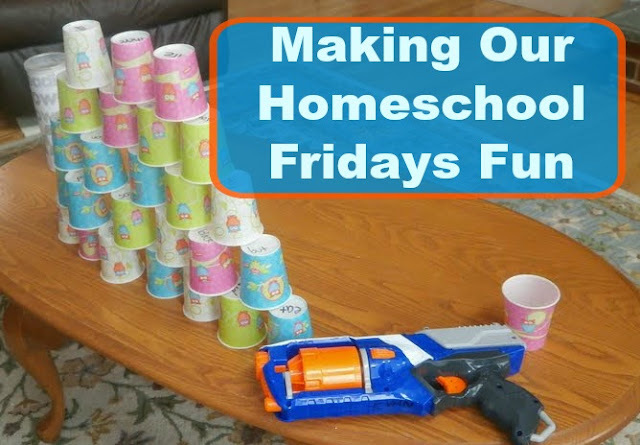 I try to make our homeschool Fridays as fun as possible. We enjoy going on field trips, playing games, and putting our books away. The boys know that Fridays are our FUN days and are usually more relaxed than the other days of the week. Some weeks I'll have a field trip already planned so we head off bright and early. Some weeks I'll go through and pull out games we haven't played in awhile or crafting and arts kids to use. Some weeks I'll declare it screen day and they can find all sorts of fun math, reading, and spelling games on the computer today. Today we declared it "favorites day" and I let the boys tell me what they'd like to do today. Ian started his day off by making himself an egg sandwich. Next thing I knew Evan was asking me to help him make some scrambled eggs for himself and Alec. He broke open all the eggs by himself and even fished out a few small pieces of shell that landed in the bowl too. He whisked them up and I showed him how to hold the handle on the pan and stir the eggs around. He took over and cooked them himself only asking for help dishing them out. He was shocked that scrambled eggs were so easy and quick to make and Alec was thrilled that Evan made him breakfast. When everyone was done eating we decided to dive into our schoolwork for the day. Evan played pop the sight word. I pulled some packing poppers out of our recycle bin and wrote a bunch of sight words on them. As Evan read the sight words he got to pop them. He always gets creative with how to pop them and today decided to practice his karate moves. He pretended that the poppers were boards and he used the palm strike or various punches to pop the words. He even allowed Alec to help him pop them since Alec thought it looked like fun too. They took turns holding them out to one another and chopping through them. The older boys have been jealous of Evan's Reading Power Towers so I made them up some Math Power Towers using multiplication facts. Just like Evan's reading towers the older boys have to know the math fact before they keep and stack the cup. They had a great time making towers while practicing their facts. Evan and I played a round of Subtraction Connect Four. I printed off two blank dice templates and we made our own dice for the game (since we needed one that went from 5-10). We then rolled the dice, subtracted the smaller number from the larger number, and covered up our answers. The first one with four in a row won and that happened to be Evan. "Connect four! I won; Oh yeah!" Evan decided to shoot down cups using his Nerf gun and make up math fact sentences about it. While we were playing our game Alec was building with the tower cups and Evan asked if he could practice math facts with cups and his Nerf gun. We did that quite some time ago but he remembered that as being a super fun activity. I handed him the container of Reading Power Tower cups just because they were handy. He counted up how many were in the container and then he set up all 30 cups in a tower and then used his Nerf gun to shoot a few of them down. He figured out how many cups he knocked down and how many were left standing. We then put it into a number sentence. He then tried knocking more of them over and lost count of how many cups he had started with. I suggested he might want to switch over to reading the sight words he knocked over instead. He thought that was a great idea and spent quite some time practicing his sight words, stacking the cups up, and shooting them back down. shooting them down is fun! Evan read the book Oh, Cats! and then my mother showed up with my sister and niece and we took a nice long break from schoolwork to visit with them all. They stayed for several hours and we all had a nice time. The boys got my mom to play some Mario Kart with them and Evan asked me to roll up the living room rug so he could pretend to ice skate with his knit slippers with some pledge on his feet. He had fun and I loved that he was cleaning the floor; even used a dustpan and broom to sweep up any crumbs or dirt. The boys settled down to eat lunch and my mother, sister and niece left shortly after. We elected not to attend our homeschool gym day today since the younger two boys were still in their pajamas and we were having fun having a lazy day at home. All the boys played outside for a bit. It was wet from last night's rain but it was pretty warm out and the boys had a great time running around chasing each other through the yard. We saw some of our typical mallard ducks on the lake today and Evan was excited that we had both male and females around. "That means we'll have ducklings on the lake this summer!" The boys rode bikes and scooters and used the swings. It was nice watching them run around with just a light sweatshirt on and we were happy to see most of our snow piles were barely over a foot high; a huge change from just a few short weeks ago. Ian worked on his dig site for a bit and when my mother in law stopped by for a quick visit Ian asked if she could buy him a bulldozer for his site for his birthday. He's just recently used his work money to buy himself two new trucks and while my husband and I keep shaking our heads over how many construction vehicles this kid now owns I can't help but support this passion he has. He's enacting out his dream job in miniature proportions everyday; that's got to be a good thing. Ian came in and we settled down to read another chapter in The Hunger Games together. As always, I made him read a page or two while I read the rest. We're renting Mockingjay for our movie tonight and Ian was stunned to learn that there really is a district 13; I gave him a brief summary of the beginning of book 3 so he'll have some idea of what's going on but I refused to tell him how it ends. I told him I'm sure we'll be able to read through all three books by the time Mockinjay part II hits the theaters! The younger two boys came in for a bit and to have a snack so I read another chapter in Harry Potter too. Alec hurt his knee and didn't want to head back outside after snack so he offered to read another chapter to Evan from their Minecraft book. They settled together on the couch read. It was such a nice, relaxing, laid back day at home and just what I needed before our busy weekend. I love this idea. We try to do fun Fridays, but I haven't been doing as good a job as you. This is inspirational. I like favorited day and letting the kids pick! I've also been known to pile board games, science kits, and crafting kits on the table that we've forgotten on shelves and told them to pick a few each and then we work our way through the day that way too.